Starting with Borderlands and more recently Destiny, the social shooter looter has been established as a fun and exciting genre. The Division is Ubisoft’s 3rd person entry into this world and bears the Tom Clancy name to boot. It’s the first new franchise in the Tom Clancy series since 2009 and Developer Massive has openly aimed to top the success of Destiny. Set in New York, post viral attack, players assume the role of a sleeper cell agent from The Division and are tasked with cleaning up the mess created by the so-called “dollar flu”. When I think Tom Clancy I immediately have some assumptions about what a game will entail. The Clancy name usually means a modern-day/near-future, realistic, and very serious setting. In days of yore I would also expect an extreme level of realism and difficulty, but pre-release material made it fairly clear The Division would not follow suit. 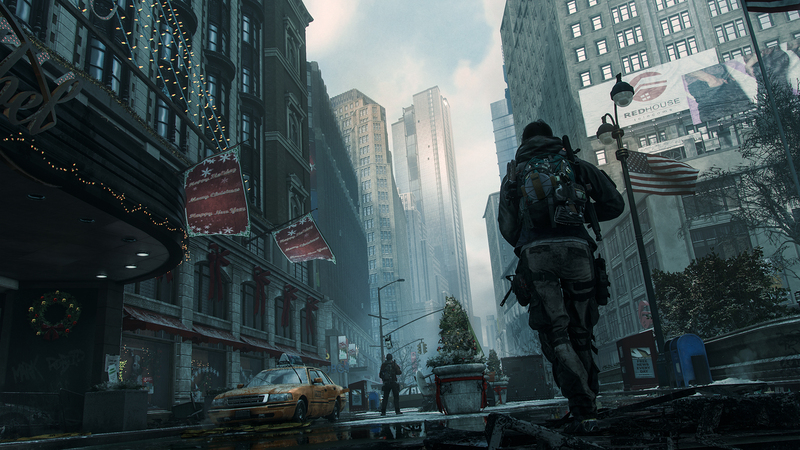 You’ll be looting real, or realistic, gear to help you pacify the semi-believable bad guys in a snowy NYC. However, The Division is not able to commit to the usual level of self-seriousness that I would expect. There are a multitude of mission givers that are injected with quirky personalities and blatant attempts at humor. The overarching narrative maintains an extremely serious tone, while a lot of the side-content has this strange jokey atmosphere around it. I found myself laughing from time to time, but more often than not it was because something completely ridiculous or silly happened, not because the writing is clever or funny. I can’t tell if The Division is self-aware, but I don’t think it is and that makes the constant shifts in tone all the more jarring. New York has been beautifully recreated with the iconic skylines, a great lighting engine, and some of the best weather effects I’ve ever seen. Civilians, gangs, and animals wander the streets filled with abandoned vehicles and looted buildings which creates a wonderfully believable setting. Unfortunately, the world crafted by the folks at Massive is home to a dreadful and nonsensical narrative. Story missions make sense beat by beat, but the bigger picture is a muddled mess. Enemy factions lack definition and motivation, there is a distinct lack of cohesion between missions, and in the last 3 levels the game tries to cobble together a villain from nothing with little to no success. There is a lot of collectible intel scattered throughout the world that has story content within it to flesh out the narrative, however the interesting bits of intel are few and far between. Hiding core story information in the literal hundreds of collectibles is a real shame, because not everyone will see that content. That being said some of the intel bits and flavor cutscenes are the best story content in the game and contribute to the outstanding setting. There are a couple of great cutscenes involving a group called the cleaners that establish what they are all about and why you should be invested in stopping them. Aside from these few notable cutscenes and intel bits the narrative is a mess and when you reach the ending, the game just sort of stops happening. The Division doesn’t live up to the quality of Mr. Clancy’s novels, but then again I doubt any of the Clancy games have. With a story this poor the focus shifts squarely onto the game’s playability and mechanics. The Division is a social game meant to be played with friends and in this respect the game is generally quite successful. Joining up with your pals is effortless and makes getting a group of 2-4 people together simple enough that you’ll be shooting with your friends in no time. If your friends aren’t around story missions offer matchmaking, which also allows you to wander the city once grouped, and safe houses exist as social hubs in each of the game’s zones. While the act of linking up with your friends is well-executed there are a few minor issues that can crop up once you begin playing together. In my estimation there are three major problems with The Division’s multiplayer systems. First off, if you and your friends play at different paces it can become difficult to play with each other unless everyone is within a 3-5 level range. Enemies scale based on the highest level player in your group regardless of the party leader’s level. This is unfortunate because it makes playing with friends who are farther behind nearly impossible. The top level player will have an easy time while the bottom level player will have to struggle just to stay alive. It would have been nice to see the system scale with different criteria, like scaling to the “host” player’s level, because the current model punishes those who would like to play missions with their friends who might be at a lower level. The latter two problems are not nearly as detrimental to the experience but are worth noting. The second issue is that second playthroughs and harder versions of missions will not pay out experience if they have already been completed on any difficulty. This again punishes friends who play at different paces. It would have been nice to see an experience payout, even if a reduced one, upon completing missions a second time or at a higher difficulty. Finally, I have not encountered this problem myself, but some of my friends have had issues with activities failing to complete when playing in someone else’s world. While getting together with your buddies is easy and the game is fun to play together, these issues are a real detriment to the social aspects of The Division. 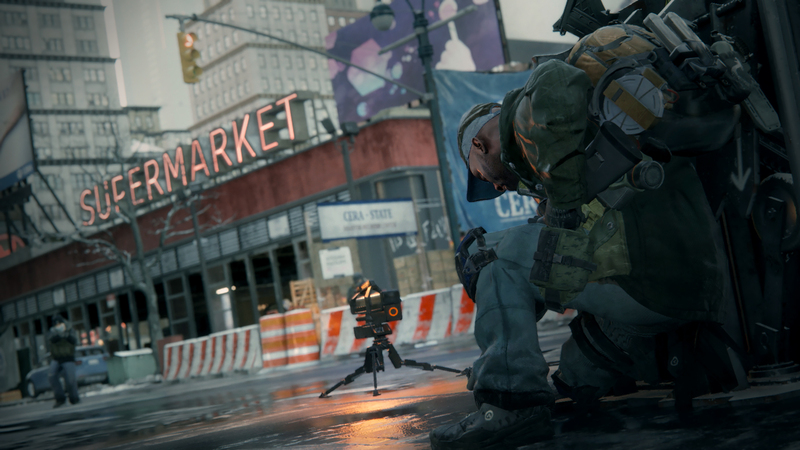 When it comes to the moment to moment action, however, The Division is lights out fantastic. Acclimating to the eclectic control scheme may take some time, but once you have it down, the game really comes into it’s own. All the guns are, or based on, real military hardware and they look, sound, and feel great. I was pleasantly surprised by the shooting and when coupled with the other combat mechanics it becomes hard to put down. As a cover shooter this game reminds me a little bit of the old Ghost Recon Advanced Warfighter games with a little less polish in the cover department. You’ll need to use cover in order to survive most encounters, but the controls have caused me problems getting into and out of it. Sometimes it’s far too easy to pull out of cover, other times it’s very difficult, and because the roll and enter cover buttons are the same I found myself sticking to cover unintentionally quite often. The other big combat mechanic is the ability system which includes things like a seeker mine, turret, improved cover, and mobile heal station. Abilities are a lot of fun to use and are free can be changed out at any time to experiment with different combinations. These abilities are linked to upgrades made back at your base of operations, which is a neat way of gating the progression. As you build up your home base with better facilities more advanced abilities, traits (stat boosts that must be equipped), and perks (smaller stat boosts that are always active) become available. In turn your base becomes more populated and watching the base flourish as you become more powerful is one of my favorite aspects of progression in The Division as it creates a sense of purpose about your actions. In order to upgrade your base you’ll need to acquire resources by completing activities a wide variety of activities around the map. Each zone contains a grip of side activities to complete and while they are relatively repetitive there was enough variety that I never felt like I was doing the same five things in every zone. Collectibles are everywhere and offer a moderately interesting diversion to get you exploring more of the city. Naturally, there are a good number of story missions to complete throughout the city, which are the real stars of the show. How these missions slot into the greater narrative isn’t always clear, but there’s usually a clear short term objective that makes sense. For example one early mission involves destroying a napalm factory that is being used to create flamethrower fuel for the aforementioned cleaners. The cleaners napalm supply needs to be cut off because they ostensibly use it to cleanse the city with fire, often burning anyone (alive or dead) that they find. Encounter design in these missions is fantastic and the objectives are varied and fun. One shortcoming that is emphasized in the story missions is the lack of enemy variety as bosses just tend to be bigger, tankier versions of regular enemies. While the enemies aren’t terribly interesting visually, the A.I. and different enemy types are capable of creating fun and engaging encounters. For the most part The Division’s activities are all well-designed with the story missions showcasing the best of what’s on offer. As with all loot-centric games you can expect to be getting new gear as your reward for completing activities and as random drops. After 30 hours I never felt like I was stagnating on a single piece of gear for too long. The drip of new guns, attachments, gear, and vanity items is constant. There are five major types of primary weapons and a variety of sidearms, each of which can be customized with scopes, magazines, silencers, and skins. In addition, there are 6 armor slots that can be modified with an attachment when you start to acquire higher level items. However, the cosmetic items are often the drops I am the most excited about. The ability to truly customize the look of your character apart from their functional equipment is fantastic and means that no two characters will ever look exactly alike. There is one major caveat to all these positives and it’s that your loot enjoyment will heavily depend on how you feel about realistic guns and clothing. None of the designs are fanciful or over the top and I can understand why some people may not find the loot quite as exciting as I did. 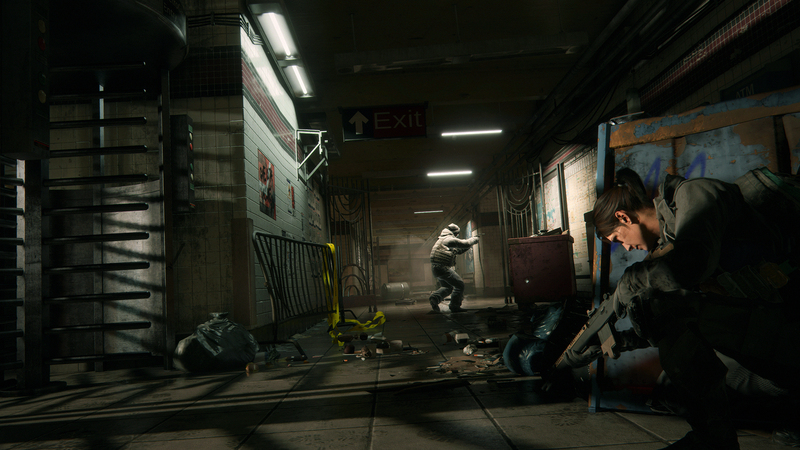 The Division’s major player versus player multiplayer component is The Dark Zone, a PvEvP environment that contains the most difficult enemies in the game. Within the Dark Zone players are able to find some of the game’s best loot, but it must be extracted via helicopter for decontamination before it can be used. This affords players the opportunity to go rogue and kill their fellow Division agents in order to steal whatever gear they have scavenged and extract it for themselves. The PvP action in the Dark Zone is among the most tense and engaging in the game and as of this writing has been patched to better balance the risk and reward of going rogue. Prior to the patch, going rogue was too costly to be worthwhile, but it’s great to see a vested interest being put towards improving the most interesting portion of the game. 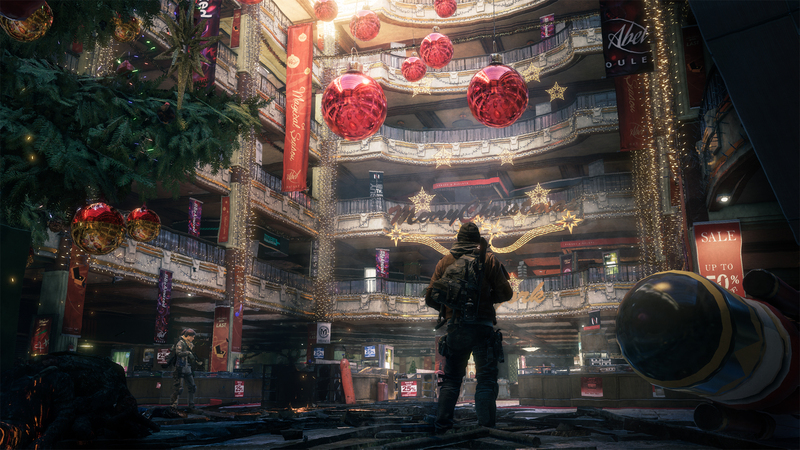 The developers at Massive have plans to further tweak the Dark Zone in free updates and in one of the announced DLCs included in the season pass. As a longtime Destiny player there a lot of parallels between it and The Division and it’s nearly impossible not to draw comparisons between the two. When comparing the initial release versions of both games I feel that The Division is a much more compelling offering as a whole product. While it lacks the incredible shooting and art direction of Destiny, The Division’s structure, encounter design, loot variety, and even narrative are all much more fully realized than vanilla Destiny. In addition, The Division successfully eliminates one of the most vexing parts of Destiny, the long and frequent load times. Massive should be applauded for their work at creating a seamless open world that you can load into once and just go. The Division offers solid gameplay and a much healthier package around that gameplay than Destiny did at launch. Like Destiny, The Division still needs some adjustment, but I think The Division has a lot of potential moving forward. If you’re looking for the perfect social loot shooter, this isn’t it. The Division is, however, a very fun game to play despite it’s faults. If you have buddies to pal around the city with, The Division is an immensely good time. However, if you’re more of a solo player it becomes harder to recommend. With a seamless and beautifully realized version of New York to explore and a bevy of content to sink your teeth into, The Division has provided my friends and I hours of fun. Side-activities offer bite-sized content that can be played in short bursts, while story missions offer lengthy and well-crafted encounters that are a blast despite the subpar narrative. All told The Division is just a great deal of fun and if you have friends to group up with it’s easily worth your time and money.